Among the many toys and gadgets purposely crafted for a dog’s entertainment, the flirt pole deserves a spot of honor as it can provide loads of fun and allows a great outlet for dogs who like to chase things. Not many stores are equipped with flirt poles, but they are becoming more and more popular as more and more dog trainers are suggesting them for dogs in need of expressing their prey drive in a non-destructive way. Since flirt poles increase exercise, they benefit dogs in many ways such as improving their balance and motor skills and strengthening those joints and muscles. Also known as “flirt stick,” a flirt pole can be described as the giant version of a classical cat toy where feathers are attached to a string to entice lazy kitties to play. This comparison after all, is not too bad, considering that the purpose is the same: to coax the animal to chase a fast moving object. A flirt pole though is a tad bit different. It’s best described as a pole made out of light wood or plastic with a lure attached at the end, quite similar in appearance to a fishing pole, only that unlike a fishing pole, the string cannot be retracted. The lure attached at the end usually consists of a toy, but can also be a rag, pieces of fleece or an animal’s hide. Flirt poles can be used in different ways. The lure can be dragged on the ground to stimulate a dog to chase it around. 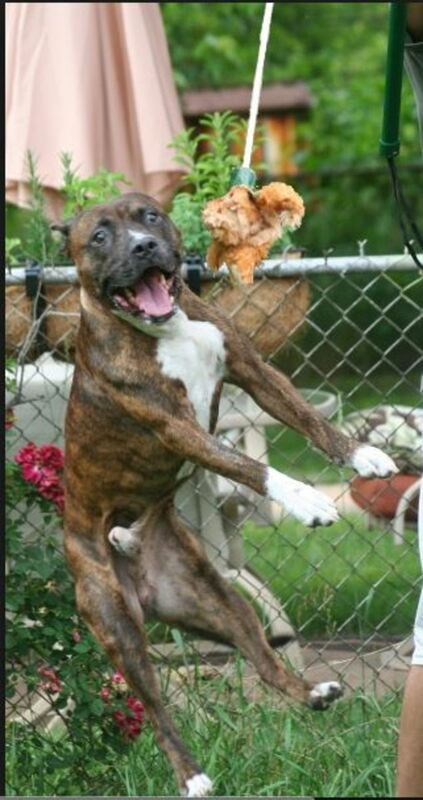 The owner may stand still in one spot and move the lure snapping the pole around erratically, or by swinging the pole higher, the owner can entice the dog to jump in an effort to catch the lure, but be careful though, as this can hurt the dog’s joints, especially in young dogs who are developing. Always talk to your vet first before engaging your dog in jumping activities ans high-impact sports. A warm-up period is recommended to prevent muscle sprains. Here are some ideas on how to use the flirt pole. Flirt poles may come handy for puppies and young dogs who have lots of energy and live in small places. Make sure the area is clear of anything that can be knocked over. Flirt poles can provide an alternative to chasing squirrels or wildlife. It can make a fun rainy-day activity for bored, under stimulated dogs. A flirt pole can be also used as a way to improve a dog’s performance in certain doggy sports. Does your dog have too much energy on walks? Use a flirt pole to tire him out before a walk. Use it to train toy-motivated dogs by allowing them to play with it after performing a wanted behavior. Dogs can be taught to catch and release the lure on cue as done with tug toys. Praise your dog for catching and then ask to release. Then, resume the game. If you wish to attain better impulse control you can ask a dog to sit or lie down before resuming the game..
Use a flirt pole to work on the “stay” cue, “leave it” or “drop it” cue to improve your dog’s obedience training. Keep it handy on walks, when you need to distract your dog from something that he focuses too much on. Laser pointers, special gadgets that emit a small red dot of light that dogs chase around, have been known for causing obsessive behaviors in dogs. A main problem with laser toys is that they stimulate a dog’s nervous system triggering the chasing instinct, but since dogs never get a chance to physically catch the red dot, they never get a sense of closure and this can cause obsessive behaviors to put roots. “I’ve seen light chasing as a pathology where they will just constantly chase around a light or shadow and pounce upon it. They just spend their whole lives wishing and waiting,” explains Nicholas Dodman, veterinary behaviorist and professor at Tufts University Cummings School of Veterinary Medicine. Flirt poles, on the other hand, are a preferable option as the dog actually is given the opportunity to interact with and catch the object at the end of the pole. It’s therefore important to allow the dog to eventually catch the lure and play with it every now and then, something dogs cherish doing since they ultimately never get to catch those squirrels in yard (hopefully)! Did you know? Trainers of bomb and drug sniffing dogs know for a fact that fruitless searches where they never get to find anything may overtime cause them to become mentally drained. To prevent this mental fatigue from interfering with their jobs, trainers must occasionally take their dogs on dummy missions where they finally get to find something and are rewarded for it. For those who like to hand craft their own things, a flirt pole can make an easy Do-It-Yourself project. Simply arm yourself with about 3 feet of PVC pipe and thread an 8 feet long rope through it making a double knot so that it doesn’t slide out of the pipe. Next, securely tie a toy such as a small stuffed animal at the end of the rope and you’re done! Don’t feel like making a flirt pole yourself? No worries, if your local pet shop doesn’t stock them, you can always find them in many online stores today who can deliver it straight to your door. Do Dogs Have Blood Types Like Humans Do?